Ovingham in the 13th Century belonged to the Umfraville family and used to have a weekly market as well as an annual fair on St Andrew's Day (November 13th). In 1471, the Earls (later Dukes) of Northumberland became Lords of the Manor and held the rights of the fair. Click on the Proclamation to read it. ... festivities begin at noon with the procession featuring Morris Dancers, Rappers and country dance groups. The procession also includes children in fancy dress and various village groups. 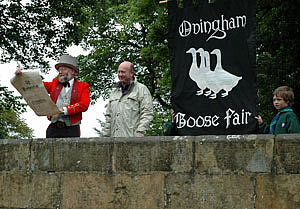 The Proclamation is made from the Packhorse Bridge at 12:15pm and the fair is officially opened by a mystery celebrity! There are about 75 stalls selling everything - plants, leather goods, hand crafted ornaments, home made cakes and goodies, garden furniture - and more. There are the usual children's attractions, face painting, ice cream, refreshments and our traditional Singing Hinnies. Morris Dancers, Rappers, Mummers, dance groups and Ovingham Drama Group entertain the spectators throughout the afternoon on the stage on the Village Green. Resident geese are often in attendance! Historical references in the mid 19th century refer to the demise of the Cattle Fair and of it “degenerating” into a mere amusement for children. But a fair selling geese was still being held on the Village Green in the 1840s. Charlie Boyd, who lived in South View (now known as Duke's Cottage) remembered his mother telling him about it. The geese were walked (despite there being since 1838, a train service in operation from Carlisle to Redheugh), from the Carlisle area, probably for the Newcastle and Gateshead markets for Christmas. Exactly when the Fair ceased is not yet known. Perhaps it was in 1939. Certainly by the early 1960s the Village Green and Vicarage Haugh had become a wilderness. In 1969, the Reading Room Committee, headed by Gladys Mills, Alan Edgar and Douglas Mennear formally applied to the Duke of Northumberland to reinstate the Fair. Permission was granted. First of all it was held on the two Wellburn fields belonging to the Regional Hospital Board and tenanted by Professor Allen of Bleach Green Farm. After a few years, when the Village Green had been restored and the Fair had outgrown the two fields, it was transferred onto the green and then extended to the Vicarage Haugh as the number of stalls increased. Now, there are about 70 stalls. A procession through the Village from the Cross still takes place but of Morris Dancers in place of the Dukes Pipers. For the first two fairs a specially composed proclamation was used but then Ron Edgar discovered the original in his Village Records. The original has been used ever since. Today, traditional Northumbrian Fare if served in the form of Singin’ Hinnies, Carlins and Pan Haggerty. The Goose Fair is always held on the third Saturday in June.